You’ve finished the design for an Apex application, and the manager asks you “when will you have it ready to test”. You resist the temptation to respond snarkily “how long is a piece of string” – which, by the way, is often the only appropriate answer if they ask for an estimate before the design work has started. Since you have a design and a clear idea of what exactly this application will do, you can build a reasonable estimate of development time. The starting point is to break down the design into small chunks of discrete modules of work, where each chunk is something you can realistically estimate to take between half a day up to a maximum of three days. In cases where it’s something you haven’t done before, you can reduce uncertainty by creating a small Proof-of-Concept application or code snippet and seeing how the abstract ideas in the design might work in reality. This is where Apex comes in handy – by the time the design has completed, you’ll have a database schema (you created the schema in a tool like SQL Developer, didn’t you – so you can generate the DDL for that in a jiffy) and you can just point Apex to that and use the New Application wizard to create a simple application. 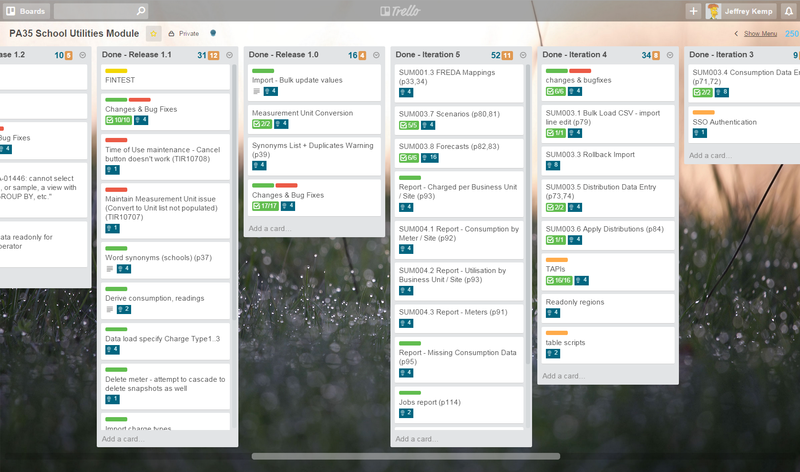 I plan all my projects using Trello, recording estimates using the Scrum for Trello extension. I don’t know much about the “Scrum” method but this extension allows me to assign “points” to each task (blue numbers on each card, with a total at the top of each list). I used to use a 1 point = 1 day (8 hours) convention, but I was finding most of the tasks were more fine grained (I was assigning 0.5 and 0.25 points to most tasks) so I’ve now switched to a convention of 1 point = 1 hour (more or less). In other words, I’d report my estimates with the assumption that my “velocity” would be 8 points per day. In addition to that, I keep a daily diary of work done in Evernote which has allowed me to do what I’ve wanted to do for a while now: measure my actuals vs. estimates for my projects, in order to calibrate my estimates for future projects. I made up a quick spreadsheet showing the development work for two projects, showing the original estimate, the start and finish dates, and actual development days worked (accurate roughly to the nearest half day, not counting non-development time like meetings and other project work). This allows me to see how my actual development time compares to my original estimates. Since my reported estimates were roughly 8 points = 1 day, it seems I tend to underestimate. It may seem that my estimates are getting better (since my Points per Day is approaching 8), but that trend is more likely a result of SUM involving a lot less uncertainty and risk and being a smaller project overall. SAM was in a new environment and new client, whereas SUM is merely an additional application in the same environment for the same client. I was also able to re-use or adapt a lot of infrastructure-type code and Apex components from SAM in SUM. The other thing that I can see from the details is that my “velocity” (points per day) is higher in the earlier stages of development, probably because I have plenty of work planned out, and I can work for several days in a row, uninterrupted by meetings and other distractions. In later stages, my attention gets divided by bug fixes, enhancement requests, meetings, doing design work for the next project, and general waiting-for-other-people-to-do-their-jobs. For my next project I’ll estimate using the same points system as above, but factor in a 7 points-per-day to the estimates that I report.